This museum at Columbia Point on the outskirts of Boston is dedicated to John F Kennedy and we found it impressive both for its architecture and its contents. The museum tells the story of his early life, rise to politics and service as America’s 35th president. There are interactive displays, re-creations of rooms in the White House and decent food outlets too. When you visit, your tour begins with an introductory film in a specially constructed theatre, which uses JFK’s own words and vintage footage to tell his story. 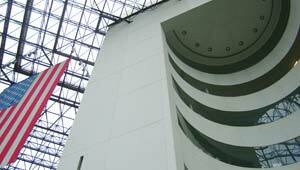 Afterwards, you exit into the main museum area and follow the story of the election in 1960 before seeing re-creations of the Oval Office and the Attorney General’s office, displays about the First Lady and the Kennedy family. You then enter the gift shop and the stunning atrium/pavilion, which has windows from floor to ceiling and a huge “Stars and Stripes” USA flag hanging from the roof. We really enjoyed our visit and you certainly learn a lot that you probably didn’t know about JFK along the way. You need to bear in mind that this is sanitised view of Kennedy though and some of the allegations levelled against him, were not even mentioned. Despite that, we thought it was absolutely fascinating and well worth the ride to get to Columbia Point. On clear days, there are some terrific views of the harbour. Take the MBTA Red line to JFK/UMASS Station and catch the free shuttle bus. The museum is open 7 days a week from 9am to 5pm with the exception of New Year’s Day, Thanksgiving and Christmas Day. The last introductory film of the day is at 3.55 pm. Adult admission is $12 (2010 prices) but you can get in free with the Go Boston Card. Address: The John F. Kennedy Presidential Library and Museum, Columbia Point, Boston, MA 02125, United States.